Used stamps (4) with slight imperfections. 2 x C1 each with SE & NH. 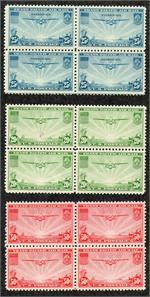 1923 2nd US Airmail Issue - C4-C6 - Set of 3. Hinged. All 3 stamps have hinge remnants. Blocks of 4. 3 never hinged stamps + 1 hinged stamp in each block.